Mariano. No player or coach outside the Yankees clubhouse ever wanted to see “The Sandman” enter a game. Number 42 will be retired forever throughout Major League Baseball at the end of this season. It is the uniform number that Jackie Robinson wore: now on but one, with his own legacy. 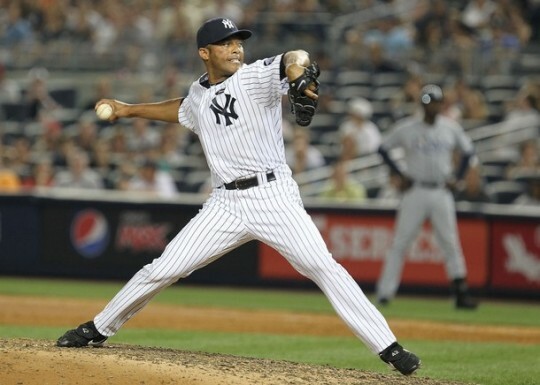 Mariano Rivera, who will be forty-four on November 29, my (Evander’s) wedding anniversary, is playing his last season. Mark a second date: March 9, 2013. At an emotional but upbeat press conference at the Yankees Tampa spring-training facility that morning, a rare Saturday event in late winter (following New York-snowstorm “Saturn” the day before), surrounded by family, teammates, team brass, and the press, Rivera made it official. He will move on. I have been fortunate to watch two ballplayers who are the best at what they do. The first is lead-off specialist and base-stealer extraordinary, Rickey Henderson. Rivera, probably the greatest relief pitcher, certainly the greatest “closer,” is the second. Two more different personalities could not be imagined. Henderson has rarely if ever been described as “a team player.” But baseball is an odd mix of teamwork and the individual talent. Rivera has always been team first. Mo is also a Panamanian gentleman of deep humility. Rickey…well, Rickey is Rickey. I have also been fortunate to see the entire Rivera career unfold, as a fan, from the first-round playoff, second (the first was held on Yom Kippur, which I would not attend; I also came by a ticket on pure faith [that word again!] alone as I ordered two seats at a time in the season when the Yankees were a long shot to be playing at all thro October—a club for some fifteen years out of the playoffs picture) game in 1995, when a skinny kid, with a history of arm trouble and an unbelievable fast ball, was brought in by tyro-manager Buck Showalter to face a powerful Seattle Mariners lineup over the course of a few innings. It was long before Rivera’s ultimate role. (He had marked similarities to Ron Guidry, another lean athlete with a history of arm woes: another late bloomer with a single pitch that could not be hit.) Rivera pitched brilliantly that night. I never imagined I was watching the birth of the best. This entry was posted in Baseball, Right Off the Bat Website, Yankees and tagged Buck Showalter, Jackie Robinson, Major League Baseball, Mariano Rivera, New York Yankees, Rickey Henderson, Ron Guidry, Seattle Mariners. Bookmark the permalink.